Isis criminals and its supporter states have to be sent to the international court for crimes against humanity. Turkey should open its border for humanitarian aid corridor to Kurds. Brussels, 1 July 2015 – Middle East Diplomatic (MED) – The final declaration of the Kobani conference hosted by EU Parliament today calls to UN, EU and the international community to bring the isis/daesh/al qaida / al-nusra criminal gangs and their state/governmental supporters to international court for crimes against humanity. The conference delegates also asked Turkey to open its border and insure the necessary conditions for humanitarian aid to be delivered to those in need in Kobani and other parts of Kurdish region in Syria (Rojava). 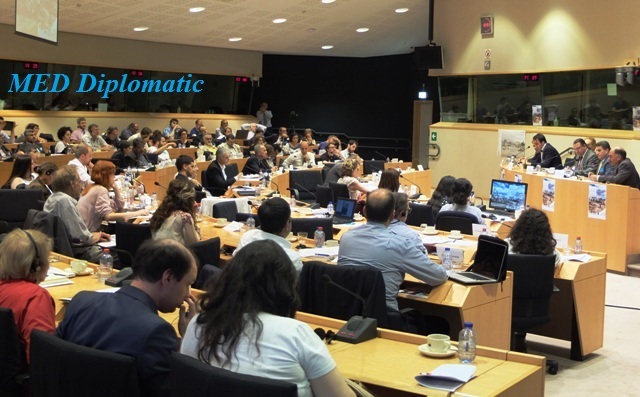 The Kobani conference in the EU Parliament raised high attention and big interest: Members from different political groups in the EU Parliament and over 40 European and international NGOs and humanitarian organisations attended the event. The President of the EU Parliament Martin Schulz send a video message to the conference delegates, while EU External Service was represented by Head of EEAS Middle East Division Director Vassilis Bontosoglou. In his video message, President Schulz told that “I am honoured to welcome to all participants from EU institutions and international organisations which would like to build Kobani destroyed by isis terror organisation”. The conference titled “International Mobilisation for Rebuilding Kobanê” aimed to rebuild the city as symbol for humanity. The international NGO’s, humanitarian aid organisations, members and representatives of different political groups in the parliament and EU Commission/EEAS offered and promised more support to Kobani and Rojava.